Kate Moss picked up a Brit Award on David Bowie's behalf while wearing one of his Ziggy Stardust costumes! When you're David Bowie & can't make it to an awards ceremony, who are you going to pick up to do it for you? There is only one answer! Kate Moss! 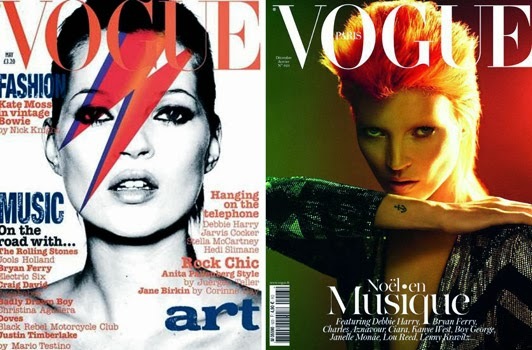 Kate Moss showed up in one of Bowie's stage costumes from Ziggy Stardust years. The red playsuit printed with white rabbits, called the "Woodland Creatures" costume, was worn by Bowie on stage in 1972. Kate Moss read out a short speech on behalf of David Bowie: "Good evening ladies and gentleman, David has asked me to say this. In Japanese myth the rabbits from my old costume that Kate's wearing live on the moon. Kate comes from Venus and I from Mars, so that's nice. I'm completely delighted to have a Brit for being the best male, but I am, aren't I Kate? I think it's a great way to end the day. Thank you very, very much and Scotland - stay with us."